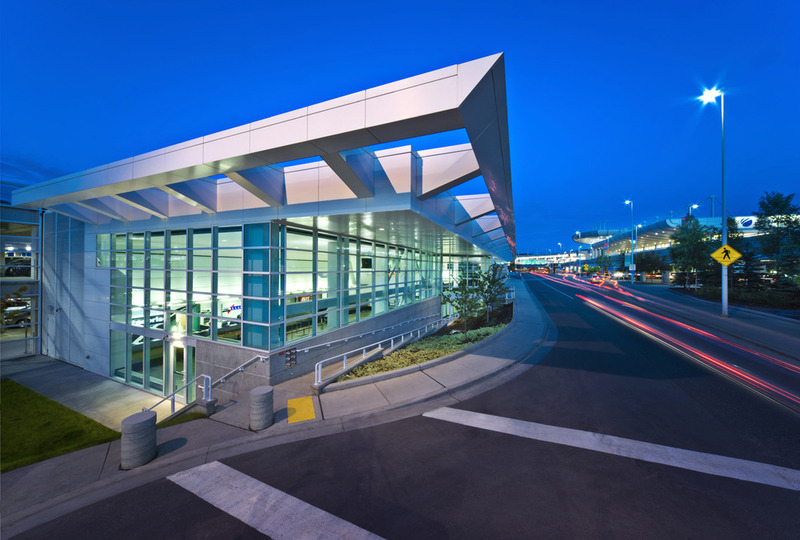 This project is a privately developed, consolidated rental car facility located on the property of the Ted Stevens Anchorage International Airport (TSAIA). The design intent was to provide travelers efficient access to both rental cars and the airport. Adjacent to the main terminal, the facility consists of a parking structure and customer service center shared by eight rental car companies. One of the main goals of the project is to meet the needs of the rental car companies for consolidating amenities such as fueling, car washing and vehicle storage in the same location as the customer service counters. Four levels of parking, car wash facilities, sixteen fueling stations, and office space were incorporated into the design. The public portion of the facility provides access to customer service counters, the tunnel leading to the train depot, and a link to the airport’s main terminal. To provide a more aesthetically pleasing environment for customers, the design incorporates natural lighting, ease of circulation, and generous open spaces. The facility is currently designed to accommodate the rental car companies with the flexibility to serve their future growth and needs.